What This Book Is About.How to Use This Book.But Isn't This Too Dangerous?Acknowledgments. A Brief History of Software.Bad Software Is Ubiquitous.The Trinity of Trouble.The Future of Software.What Is Software Security?Conclusion. A Taxonomy.An Open-Systems View.Tour of an Exploit.Attack Patterns: Blueprints for Disaster.An Example Exploit: Microsoft's Broken C++ Compiler.Applying Attack Patterns.Attack Pattern Boxes.Conclusion. Into the House of Logic.Should Reverse Engineering Be Illegal?Reverse Engineering Tools and Concepts.Methods of the Reverser.Writing Interactive Disassembler (IDA) Plugins.Decompiling and Disassembling Software.Decompilation in Practice: Reversing helpctr.exe.Automatic, Bulk Auditing for Vulnerabilities.Writing Your Own Cracking Tools.Building a Basic Code Coverage Tool.Conclusion. The Trusted Input Problem.The Privilege Escalation Problem.Finding Injection Points.Input Path Tracing.Exploiting Trust through Configuration.Specific Techniques and Attacks for Server Software.Conclusion. Client-side Programs as Attack Targets.In-band Signals.Cross-site Scripting (XSS).Clients Scripts and Malicious Code.Content-Based Attacks.Backwash Attacks: Leveraging Client-side Buffer.Conclusion. The Defender's Dilemma.Intrusion Detection (Not).Partition Analysis.Tracing Code.Reversing Parser Code.Example: Reversing I-Planet Server 6.0 through the Front Door.Misclassification.Building “Equivalent" Requests.Audit Poisoning.Conclusion. Buffer Overflow 101.Injection Vectors: Input Rides Again.Buffer Overflows and Embedded Systems.Database Buffer Overflows.Buffer Overflows and Java? !Content-Based Buffer Overflow.Audit Truncation and Filters with Buffer Overflow.Causing Overflow and Environment Variables.The Multiple Operation Problem.Finding Potential Buffer Overflows.Stack Overflow.Arithmetic Errors in Memory Management.Format String Vulnerabilities.Heap Overflows.Buffer Overflows and C++.Payloads.Payloads on RISC Architectures.Multiplatform Payloads.Prolog/Epilog Code to Protect Functions.Conclusion. Subversive Programs.A Simple Windows XP Kernel Rootkit.Call Hooking.Trojan Executable Redirection.Hiding Files and Directories.Patching Binary Code.The Hardware Virus.Low-Level Disk Access.Adding Network Support to a Driver.Interrupts.Key Logging.Advanced Rootkit Topics.Conclusion. Greg Hoglund has been a pioneer in the area of software security. He is CEO of HBGary, Inc., a leading provider of software security verification services. After writing one of the first network vulnerability scanners (installed in over half of all Fortune 500 companies), he created and documented the first Windows NT-based rootkit, founding rootkit.com in the process. Greg is a frequent speaker at Black Hat, RSA, and other security conferences. Gary McGraw, Cigital's CTO, is a leading authority on software security. 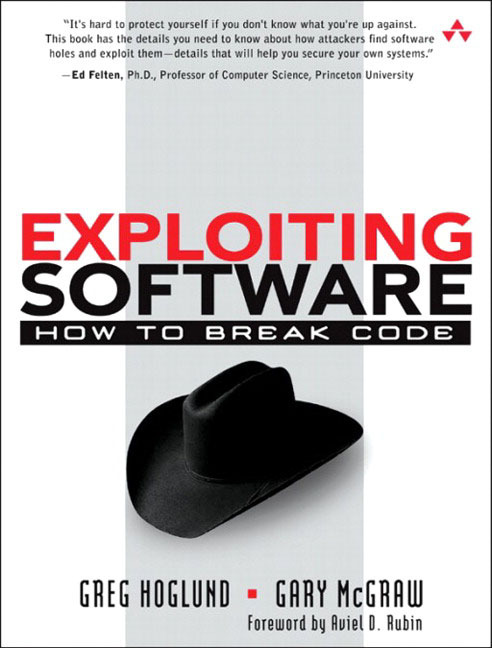 Dr. McGraw is coauthor of the groundbreaking books Building Secure Software and Exploiting Software (both from Addison-Wesley). While consulting for major software producers and consumers, he has published over ninety peer-reviewed technical publications, and functions as principal investigator on grants from DARPA, the National Science Foundation, and NIST's Advanced Technology Program. He serves on the advisory boards of Authentica, Counterpane, and Fortify Software. He is also an advisor to the computer science departments at University of California, Davis, and the University of Virginia, as well as the School of Informatics at Indiana University.